A wildcat moves softly through his Highland world describing it through feline eyes in exquisite golden detail. Scent is a language of its own. His is an elemental world of rain and snow, of forest, moorland and mountain. A world of changing seasons and the endless dance of life and death; predator and prey. Although the wildcat’s home is a world of poetic beauty it is also one of sudden terrifying violence where the ultimate predator is mankind. Shot deliberately by a gamekeeper on a shooting estate the wildcat nearly dies before being rescued by a young couple. 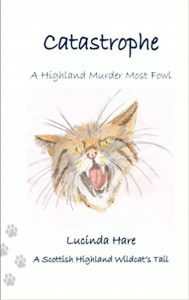 After a spell in the vets he convalesces in their Perthshire cottage where he learns to love their old bony cat, Haggis, and author Mary, The hunting moon is barely on the rise when bad news arrives from the solicitors. Mary’s beloved Aunt Edith suddenly dies and the couple head north into the Highlands with Catastrophe. Arriving at Driechandubh Castle, where Mary was raised by Aunt Edith, they barely escape with their lives as a large chunk of masonry ‘accidentally’ falls in a storm. Things don’t improve as they meet odious Aunt Maud, Edith’s envious sister who has ensconced herself in the castle like a cuckoo, under the pretext of nursing Edith. As an apex predator Catastrophe instinctively sees through Maud’s charade as the grieving sister: he can scent her underlying fear and hostility at her niece’s unexpected arrival, and hear the falsehood in her voice. Aunt Maud is hiding a terrible secret. Aunt Maud mistakenly sees Catastrophe merely as a fashion accessory. Divided by mutual loathing Catastrophe finds himself drawn into a web of intrigue, murder and adventure that will test our magnificent wildcat sleuth to his limits. Can Catastrophe unravel odious Aunt Maud’s dastardly plans before it’s too late? Targeted Age Group:: Family Book ~ All audiences 8 years to 108 years young! I was inspired by the plight of our beautiful Scottish wildcats who are facing extinction. They prowled the Earth long before man or domestic moggies came on the scene arriving here in the UK at the end of the last Ice Age, and yet finally, after centuries of persecution, deforestation and interbreeding they are on the brink of disappearing forever like our wolves, bears and lynx before them. Scottish wildcats are no domestic moggies; larger, far more powerful with superior senses and a thick coat adapted to living through harsh Highland winters they are fearless, intelligent, adaptable and cautious worthy of our respect and protection. I wanted to tell their story in a fun and informative way that would engage readers of all ages by writing a cosy cat mystery with a difference, narrated by the wildcat himself who draws you into his world, and written for all the family aged 7 years +to 107 years. The character of Catastrophe wasn't hard at all, I culled his characteristics from the countless large and little opinionated, funny, ungrateful and feisty cats I have adopted and whose language I have learnt; but more than any other he is based upon fiery and feisty ginger Rufus, a cat I adopted from Midlothian cat rescue on valentines day 2005. He had been in care for years and years and was intelligent, frustrated and feisty. He had become very plump and loved his food. Rufus was quite a challenge to introduce to the rest of the family and the first time I took him into the local vet he was hanging of the vet's (forewarned to wear an arm length gauntlet) arm, yowling and growling his displeasure. But goodness, underneath, if you treated him with respect and love on his terms, what an awsome magnificent cat he was. I miss my beloved boy very much; he lives on in Catastrophe. I woke to a cool dawn, my coat laden with dew and the taste of blood and bones still fresh in my mouth. It was a good hunt. High above, trapped by the grasping branches of a rowan tree, the corpulent moon turned everything to milk and moon-shadow. A tawny owl hooted softly to his mate as I rose and stretched my limbs, testing the layers of darkness with eyes and ears and nose. Leaf-litter and cool earth oozed between my pads. Soft sounds vibrated like plucked strings in the still air, shivering along the hairs of my pelt, describing this moonlit world for me in golden detail. Scents hugged the misty floor of the forest. I tasted them with my tongue, some fresh, some days old. Tracks criss-crossed the clearing; I read them as easily as any child’s book. An old brock had passed me by in the early hours of the night. His sett lay to the north, beneath a chestnut tree brought down by early autumn winds. A dog fox and his vixen had stolen some time to play in the bracken before hunting for rabbit. Pellets of bone, sinew and skin are all that mark the passage of countless unwary mice and voles foraging for brambles beneath the golden harvest moon and the sharp eyes of the owls. Wind fluted through bare branches with a feline hiss. The promise of dawn was a finger of light on the distant horizon and the feathered folk slept on; feathers fluffed against the cold, they felt safe at the end of their slender branches. Beneath them water leapt down its course, tumbling stones and silver trout into the loch. Dancing between silver birch and rowan, I paused to drink the freezing milky-blue snowmelt. Unsheathing my claws, I honed them on the deep-scored bark of an old witch-elder. Intruders beware! The brittle leaves barely betrayed my thistledown passage. Like the year, they were old and dying; the sap that was their lifeblood drawn back into the tree that birthed them. Abandoned to the frosts, they lay in deep drifts, burying the hedgehogs and wood-mice beneath gossiping carpets of yellow and red leaves. There was growing light at last as I floated across the dark, newly furrowed fields. A foolish cockerel took a deep breath and fell with a strangled squawk, his life ebbing faster than the night. As light blossomed in the east, I faded back into the fringe of the forest with my prize. The moon waxed and waned. Winter drew closer and the sun grew ever lazier. Wrapped in a jacket of yellow fog she could scarcely be bothered to rise. Perhaps she was like the hedgehog, and would hibernate all winter beneath a blanket of fog and frost? The mighty chestnut trees shed their prickly bounty, shaken by storms that drove the sheep with their woolly coats behind the feeble shelter of dry-stane pens. Children invaded the woodlands, weary parents in tow; they stamped with glee on the green armoured shells, releasing the russet and white kernels snuggled at their hearts. Threading them with string they fought, squealing loudly, crying out when their careless fingers were caught. The wind swung to the east, bringing with it the promise of snow and a hard winter. The pheasants quarrelled and quibbled in stubble fields, fighting for drops of grain. They were easy to catch, being slow and stupid. Musical geese flew high overhead, heading for warmer climes, their white wings touched to gold as the sun went down. Dusk was netted by filigree cobwebs pearled with dew, each drop ruby red. Night threw down his mantle; the moon had yet to rise. The hunt was on again. Early snow lay crisp on the ground when I heard them shout to each other out on the moors where the grouse nest. In the woods I could hear them stumbling around, clattering from tree to tree, loud as magpies. Everything fled before them. A chocolate-brown pine marten hid in a hollow tree. A red squirrel took graceful flight through the air. From the safety of the forest I had watched these furless two-legs since I was a litter-cub. They are strange animals indeed who walk upright on their hind legs and have no tail or feathers to help them balance. Pale, and soft skinned as the underbelly of a slug, the furless-ones steal the pelts and coats of others to survive. Yet there are colours and shapes their eyes do not see. There are sounds they cannot hear. Their noses are too far from the ground and are surely useless for tracking. For furless-ones the landscape is forever fixed. To me, every subtle shade, every scent on the wind, every track tells a story. But the furless-ones have fire, and they have guns, and like all furred and feathered creatures of woods and moors, I greatly feared them. Bang! Sound splintered through the forest. My paws burst into a run before my ears and eyes could identify the danger. A red fox bounded over bracken and bramble. Dogs barked. Bang, bang! Instinct led me blindly racing through the trees towards my winter den, a cairn of rocks at the fringe of the forest where it opens onto moorland. Thump…thump…thump…thump…my heart slammed against my chest. Fleeing pheasants ran this way and that, colliding with each other in their panic. A capercaillie cowered down. Rabbits hurtled into the dark safety of their burrows. I had no time for them now. Briars tore and whipped. A freezing burn; a fleeting flash of foam and silver beneath my paws. Two red deer leapt past me. A pheasant finally took to the air, its feathers whirring. Excerpt from much later in the story at Driechandubh Castle ~ Taking refuge beneath Aunt Maud’s voluminous skirts the old rat had thought herself safe. I pounced. As her skirts took on a life of their own, Aunt Maud let rip a scream of outrage and aimed a vicious kick at me. She hadn’t even seen the rat! I yowled and Mary leapt angrily to her feet. Weaving deftly around chairs and legs, the cunning old creature scrabbled up a long pair of stockings and out of my reach. I shot out beneath the chair. The Heron shrieked hysterically as the equally agitated rat ploughed through her dinner, leaving little gravy paw prints on the pristine tablecloth. Her wineglass shattered on the table splattering wine over Stanley. Caught by a wildly flailing fork, her necklaces broke; pearls rattled to the floor like hailstones as the Heron fled from the dining room, but all eyes remained riveted on the drama being played out on the table. As Prune stood rooted to the spot, the rat ploughed gamely on through a dish of potatoes. Tripping over the salt cellar she knocked over a candelabra. Unable to stop, she pirouetted gracefully through Crispin’s loaded plate and landed in his lap along with most of his meal. There was a loud crash as both chair and man fell backwards. His heavy kilt and sporran flew upward presenting the table with a matching set of tartan boxer shorts. With a cluck of consternation, Prune finally cranked into action, throwing a well-aimed napkin over the offending underwear, which merely fuelled Crispin’s panic. ‘Get it off! Get it off!’ He was thrashing around dementedly on his back, stabbing down with a fork. Bits of fur flew in every direction. The rat however had already moved on and was making a break for it through the open dining-room doors. I let her go. This was far better sport. I pounced, and grabbing the object of Crispin’s attentions, ripped it off and thoroughly savaged his sporran.